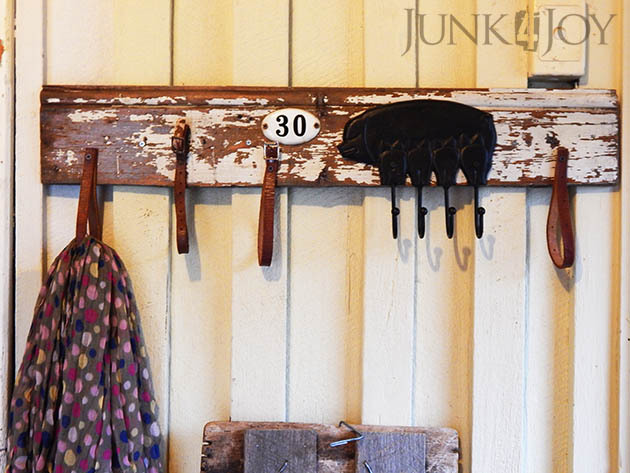 Everything in our home is multipurpose. I mean, it can (and often has) been used previously in many places and for many different uses. Take this little pig with her piglets. She once lived in the kitchen to hold keys. 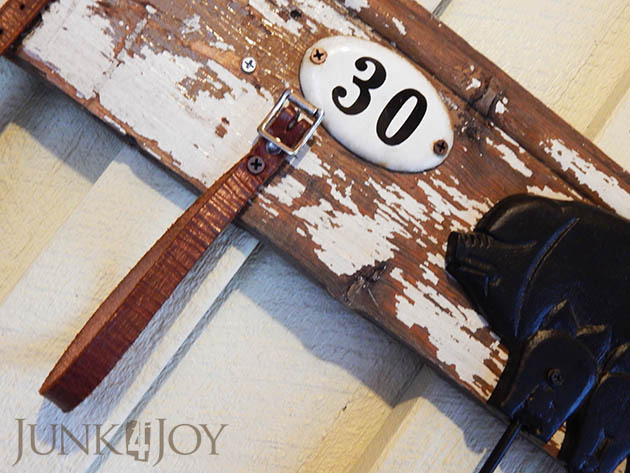 The old enamel house number is from Wayne’s childhood home, it also lived in the kitchen at one stage. Now, they’re together again as part of my new scarf hanger. This was a quick and easy project that took me weeks to photograph and share. Between us, we have a zillion coats, jackets, beanies, hats and scarves. 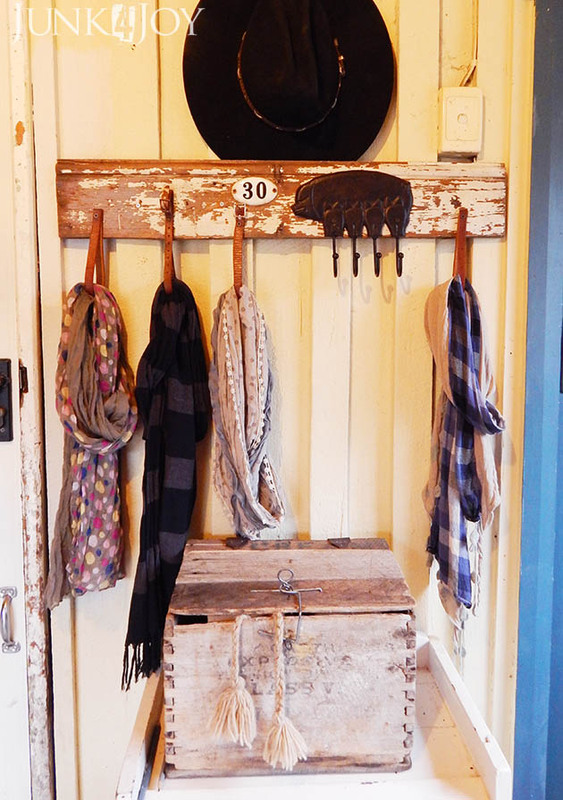 I made a whole lot of coat racks to hold the hats and coats, I put up an antique coat rack which I got from my grandmother’s house in Greece for our scarves and beanies… but I wanted to keep my prettier scarves separate from the practical warm ones. I looked around at what I had and found this chippy bit of timber lining. All I did to this was wash it and scrape off the loose bits of paint. I found a thin leather belt I’d collected from a tip shop, and a small bit of leather which was probably some kind of collar, maybe… also from a tip shop. I cut these to the right length to make loops to hold scarves. Mainly cause I didn’t have anything I liked to act as hooks for this project. I left the buckles on a couple of the leather straps just for something different. I added the pig for other odds and ends and added the number just because. 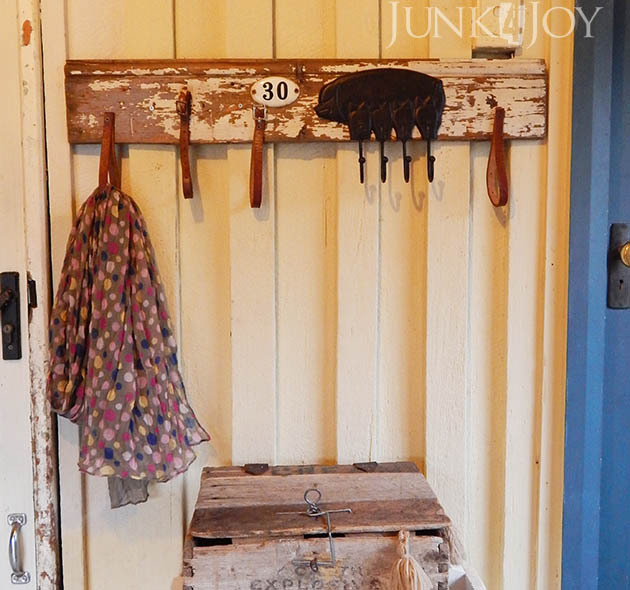 Its the first thing you see when you walk into the mudroom, hanging between the door to the house and the door to the toilet. Below it, on a small cabinet, is a rustic box Wayne revived, now holding gloves. That box used to be my ‘in house’ toolbox in a previous life. So there you go. A little something new for the house to make life a little more organised. 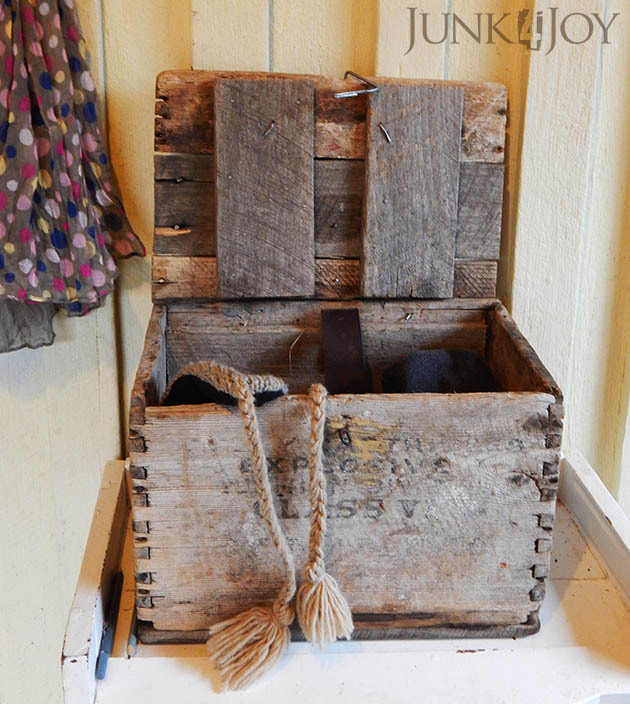 This entry was posted in DIY, recycling, repurposing, rustic, thrifting by zefiart. Bookmark the permalink.